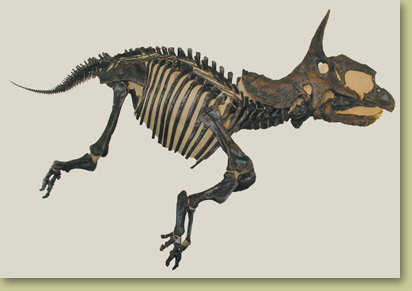 Skeletons of Triceratops are very rare. Only a few have been discovered in the nearly 150 years of exploration for dinosaurs in the American west. Skulls of Triceratops are fairly common due to their massive bone structure, however, predators often scavenged their skeletons, leaving little behind. This skeleton, called 'RAYMOND' (after a local rancher), is one of the best-preserved skeletons, and the only articulated Triceratops skeleton ever found. The specimen laid on its right side after death, and was buried. The left side was later exposed during the Pleistocene, and destroyed by weathering. It was buried again by nature, and only recently re-exposed by erosion. The articulation of the legs of Triceratops has long been a point of controversy for paleontologists. Even though RAYMOND is only the right side of a skeleton, it clearly shows the articulation of Triceratops leg. The professional field crew that excavated this dinosaur took care to preserve its original articulation. Only the bones from the skull and tail have been repositioned. This specimen indicates that Triceratops stance and gait were uniquely that of an ornithischian dinosaur. Because of its natural articulation, this is a replica of one of the most important osteological specimens of Triceratops. Mounted upright on a steel base or inquire about a mounting apparatus to hang it directly on a wall. For more info and pictures on Triceratops go to Triceratops Interesting Info page. Notes May take approximately 4 months for production. Check with us to see if an earlier delivery is possible. Extras Crate and packing fees apply. Please contact us for details.